The administrators of Stylo, which owns the Barratts and PriceLess chains of shoe shops, is closing 220 stores with the loss of 2,500 jobs. The remaining 160 stores and 165 concession outlets have been sold to the old management, saving 3,000 jobs. The management team of the Bradford-based firm will still be led by chairman Michael Ziff. 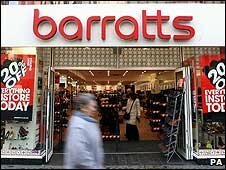 Barratt and PriceLess were put into administration on 26 January and the parent company followed on 17 February. "Given the difficult trading environment, we are pleased to have achieved a deal which will save 160 Stylo stores and 165 concession outlets across the UK and Ireland, thereby safeguarding 3,000 jobs," said Neville Kahn, one of the administrators from Deloitte. "Due to difficult short-term financial difficulties and the long-term sector outlook, however, the store portfolio was deemed to be too large, and unable to generate sufficient profits to cover its cost base. As a result, the remaining 220 stores will be closed imminently, with the regrettable loss of 2,500 jobs."